Before you migrate data to Amazon Redshift, you convert the Oracle schema to an Amazon Redshift schema as described following. Launch AWS SCT. In AWS SCT, choose File, then choose New Project. Create a new project called DWSchemaMigrationDemoProject. Enter the following information in the New Project window, and then choose OK.
Use the default Projects folder and the default Data Warehouse (OLAP) option. Use the OracleJDBCConnectionString value you used to connect to the Oracle DB instance, but remove the JDBC prefix information and the port and database name suffix. 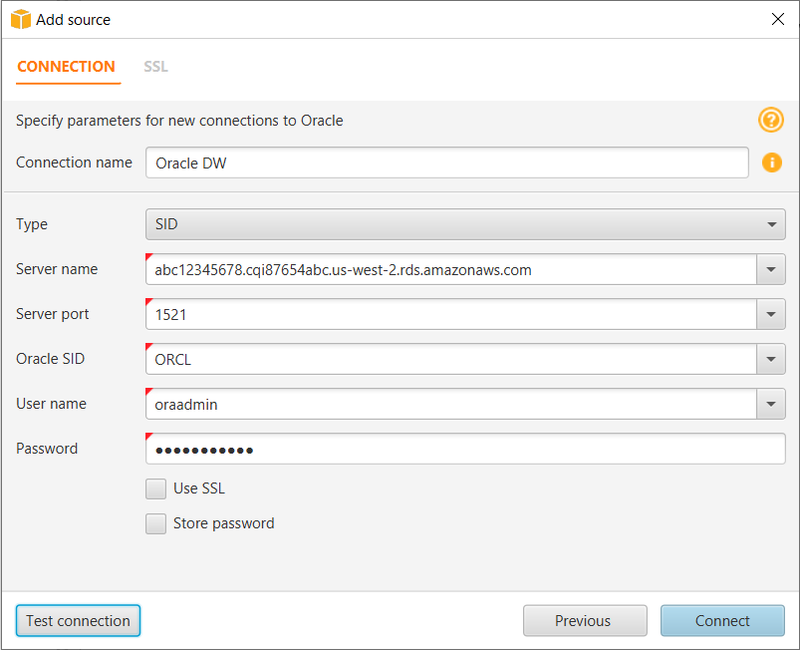 For example, a sample connection string you use with SQL Workbench/J might be "jdbc:oracle:thin:@abc12345678.cqi87654abc.us-west-2.rds.amazonaws.com:1521:ORCL". For the AWS SCT Server name, you remove "jdbc:oracle:thin:@" and ":1521:ORCL" and use just the server name: "abc12345678.cqi87654abc.us-west-2.rds.amazonaws.com". Choose OK to close the alert box, then choose OK to close the dialog box and to start the connection to the Oracle DB instance. The database structure on the Oracle DB instance is shown following. Select only the SH schema. If the SH schema does not appear in the list, choose Actions, then choose Refresh from Database. Choose Connect to Amazon Redshift. 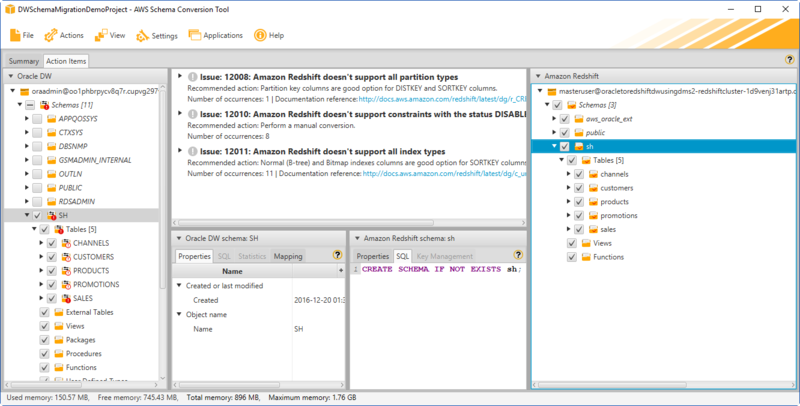 In the Connect to Amazon Redshift dialog box, enter the following information and then choose Test Connection. 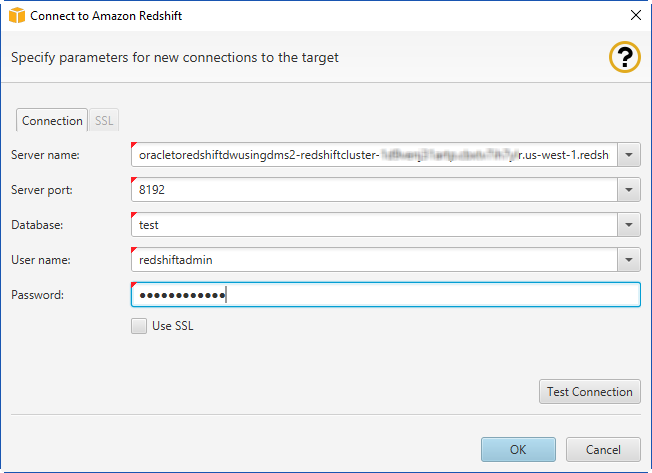 Use the RedshiftJDBCConnectionString value you used to connect to the Amazon Redshift cluster, but remove the JDBC prefix information and the port suffix. 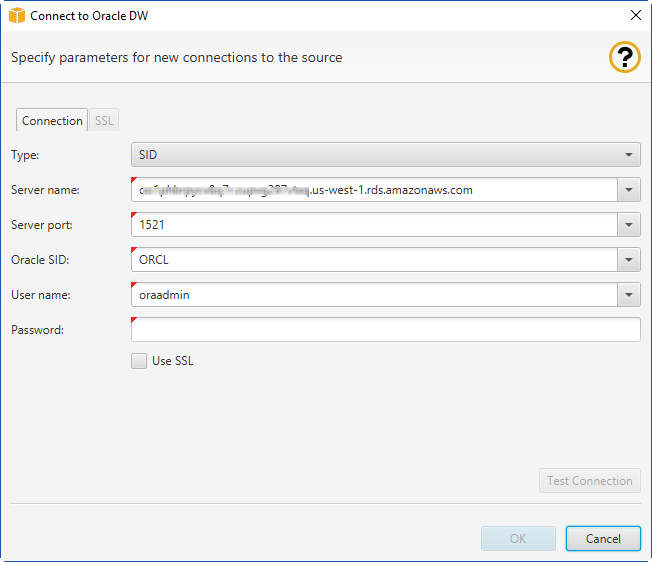 For example, a sample connection string you use with SQL Workbench/J might be " jdbc:redshift://oracletoredshiftdwusingdms-redshiftcluster-abc123567.abc87654321.us-west-2.redshift.amazonaws.com:5439/test". For the AWS SCT Server name, you remove " jdbc:redshift://" and :5439/test" to use just the server name: "oracletoredshiftdwusingdms-redshiftcluster-abc123567.abc87654321.us-west-2.redshift.amazonaws.com"
AWS SCT analyzes the SH schema and creates a database migration assessment report for the conversion to Amazon Redshift. Choose OK to close the alert box, then choose OK to close the dialog box to start the connection to the Amazon Redshift DB instance. In the Oracle DW view, open the context (right-click) menu for the SH schema and select Create Report. Review the report summary. To save the report, choose either Save to CSV or Save to PDF. The report discusses the type of objects that can be converted by using AWS SCT, along with potential migration issues and actions to resolve these issues. For this walkthrough, you should see something like the following. Choose the Action Items tab. The report discusses the type of objects that can be converted by using AWS SCT, along with potential migration issues and actions to resolve these issues. For this walkthrough, you should see something like the following. Open the context (right-click) menu for the SH item in the Schemas list, and then choose Collect Statistics. AWS SCT analyzes the source data to recommend the best keys for the target Amazon Redshift database. For more information, see Collecting or Uploading Statistics for the AWS Schema Conversion Tool. Open the context (right-click) menu for the SH schema, and then choose Convert schema. The choice of the Amazon Redshift sort keys and distribution keys is critical for optimal performance. You can use key management in AWS SCT to customize the choice of keys. For this walkthrough, we use the defaults recommended by AWS SCT. For more information, see Optimizing Amazon Redshift by Using the AWS Schema Conversion Tool. In the Amazon Redshift view, open the context (right-click) menu for the SH schema, and then choose Apply to database to apply the schema scripts to the target Amazon Redshift instance. Open the context (right-click) menu for the SH schema, and then choose Refresh from Database to refresh from the target database.